I received a ContourHD helmet camera for Christmas. We shopped these and discovered that the latest 1080p version was out, and the previous 720p version was on sale at Amazon with a gift card deal, so we got the previous version, the ContourHD, and my Wife kept the gift card. Win-win. The VHoldR ContourHD is a video camera in the shape of a small cylinder with attachment points. It records video to a micro-SD card. It runs off a battery so is self-contained. Because it is very light (4 oz) it is also easy to mount on a helmet, or in my case in the Cadillac CTS on the rear view mirror. The camera came with a 2GB microSD card, although additional cards (extended recording by swapping cards) and larger capacity cards can be used, up to 16 GB. The battery recharges when you attach the camera via a cable to the USB port on the PC; easy. The ContourHD does not have a video display for realtime video review. To understand and test the best mounting points for the camera in the Cadillac CTS I would try it at different points, then connect it to my netbook, download the video, and review it. I decided that attaching the ContourHD to the rearview mirror with a clear view out the front of the CTS was best. The Rearview mirror in the CTS is a large one, with the OnStar access built in to the mirror. One advantage is that the bottom of the mirror is a flat surface, so it made it easier to attach the camera. I shopped Walmart in Georgetown, SC where we are vacationing this week and found a Velcro strap to use to attach the camera to the mirror. I used a Velcro One-wrap 3ft x 1 in to attach the ContourHD. A more permanent and repeatable mounting would be more desirable, but this worked for my test drive. The ContourHD captures video in Quicktime format. It comes with an editing program that can be used to crop the video, but does not offer options to resize. VHoldR does offer online storage of captured video; the video above is on their site. Overall I am happy with the ContourHD. Because it is light and battery powered, it is easy to mount in interesting places to capture video. It is inexpensive, but appears to be well made. I am not a fan of their side rail mounting system so far, but as I become more familiar with it perhaps it will grow on me. For inside the Cadillac footage my cruisecam shortbar mount and digital camera really work well. 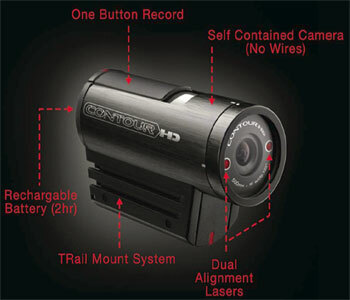 I think the ContourHD would be more interesting strapped to the exterior mirror or front air scoop. I plan to keep experimenting with placement and see what works.